When thinking back on the select artists specializing in smooth-sailing slow jams amongst the dance-driven scene of the late 1980s, it’s nearly impossible to overlook the prominent contributions of the multi-tiered Surface, a trio originally consisting of vocalist Bernard Jackson, keyboardist/flautist David “Pic” Conley, and guitarist David Townsend. Smooth grooves such as “Happy,” “Closer Than Friends,” “You Are My Everything,” and “Shower Me with Your Love” demonstrated the self-contained outfit’s adept abilities at penning, producing, and performing subtly sensual and purely charming songs which resounded with R&B and pop fans alike. Although the original formation reunited briefly during the early 2000s for some live performances, the comeback was cut tragically short with the sudden death of Townsend. A decade on, founding member Conley (who hit the R&B charts with the first version of Surface in 1983 via the sublime dancer “Falling in Love”) recently revamped the group with passionate tenor John Feva (formerly of The Black Flames) and newcomer Diamond Martinez. The resulting ReSurface is a cool collective which maintains the understated passion and grace of the aforementioned gems, while adding in a healthy dose of head-nodding swagger and updated melodic touches that make for a most enjoyable listening session on Where Have You Been. Opening with the lush “Baby Making Music,” the tone is set with a limber groove borrowing a tad or two from Marvin Gaye’s “Sexual Healing,” but with fresh phrasing delivered by Feva in a romantic fashion that bears soft nuances of Bernard Jackson’s signature style while standing out with endearing restraint. The tempo is taken up a notch with the riff-smart first single, “We Can Fly,” switching the lyrical vibe from physicality to spirituality. Feva’s nimble delivery captures an ideal match of tenderness and attitude which makes the tune ideal for both the club and riding with the top down. Meanwhile, the celestial midtempo “Say I Do” is pure classic Surface, complete with elegant piano lines, percussive claps, and gently layered vocal arrangements setting the mood for an ode to commitment and soulful sweetness. During and after the years of Surface’s commercial peak, Conley exercised his writing and producing chops for artists ranging from Aretha Franklin to Immature. He shows he hasn’t lost the knack for converging a nostalgic sense of heart with modern cool on the flawlessly parlayed title cut of Where Have You Been. A sort of Isley Brothers-meets-Maxwell experience, the chord structure is ethereal and the story line straight-shooting, yet vulnerable. Similarly, the bumpin’ groove of “Diamonds and Pearls” provides a tastefully appealing backdrop for the chivalrous lyrics and the softly assuaging melodies. Where Have You Been wraps up with a kinetically engaging string of sultry steppers. “You Got What I Want” melds touches of Latin percussion with Conley’s expertly placed flute touches set against Feva’s markedly fluid interpretation of the sanguine words; the hip and funky “Finish What You Started” spotlights Diamond Martinez’s lightly sassy approach atop a persistent rhythm arrangement peppered with a delightfully harmonic chorus and lead trade-offs with Feva. The assertive and energetic “Get Up” closes the set on a motivating and celebratory note, meshing a message of self-reliance with a Michael Jackson-inspired chorus and compelling synth breakdown. 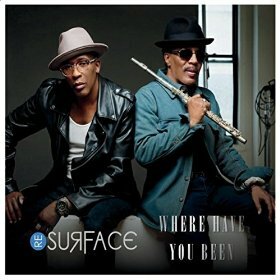 Longtime fans of Surface and younger listeners with an appreciation for rare groove and sophisticated R&B alike will find a menagerie of sonic pleasure on Where Have You Been. Thirty years after the initiation of the group, Conley has remarkably managed to retain the authenticity and essence of the original concept while making it solidly palatable for the modern world. Highly recommended.